Michael Zadoorian is the author of two novels, THE LEISURE SEEKER (William Morrow) and SECOND HAND (W.W. Norton) and a story collection, THE LOST TIKI PALACES OF DETROIT (Wayne State University Press). A motion picture of THE LEISURE SEEKER starring Helen Mirren and Donald Sutherland is scheduled to be released in 2017. Zadoorian is a recipient of a Kresge Artist Fellowship in the Literary Arts, the Columbia University Anahid Literary Award, the Michigan Notable Book award, the Great Lakes Colleges Association New Writers Award and was long-listed for the International IMPAC Dublin Literary Award. 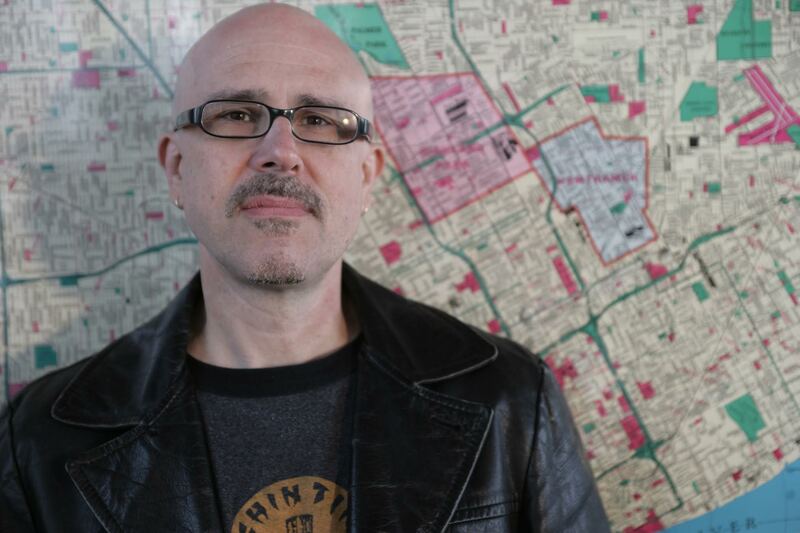 His work has appeared in The Literary Review, Beloit Fiction Journal, American Short Fiction, Witness, Great Lakes Review, North American Review and the anthologies Bob Seger’s House, On The Clock, and Detroit Noir. What inspires you to create? A lot of things inspire me to write. Often I just notice things out in the world, the light a certain way, phrases that people speak, moments that move me in some way. So I write them down. (You always think you’re going to remember, but you never do, so write them down.) Then I just copy all them down into a big document. (Which, after decades of doing this, is now hundreds of pages long.) Later, when I’m trying to come up with a story or a book idea, I go to my notebook file. There’s always something there that sparks an idea. Detroit also continues to inspire me. I’ve lived here all my life and it took me a long time to realize that was a gift. It’s important to know who you are and where you live. Good or bad, Detroit is a huge part of who I am as a person and a writer. I like writing with a strong sense of place and Detroit has it. Can you describe your greatest creative achievement? Not really sure what that is. My first answer wants to be the first time that I finished a full-length novel. It’s a hard thing to do and a lot of writers whom I admire never manage to do that. It’s difficult. That said, I’m very proud of my published books. It makes me feel good to know that I never wrote anything thinking, “This is sure to sell!” I’ve always written what I wanted to write. That’s very important to me. Rest assured that has backfired on me a few times. I still have finished novels that I haven’t gotten out into the world. I’m not sure why, but I do know that no matter what happens to them, they were books that I wanted to write and they were important to me. A friend of mine once said, “When you write a novel, you find out what your obsessions are.” I couldn’t agree more. Nothing revolutionary, I’m afraid. Do your work. Nothing is going to happen unless you do your work. Keep trying. Put in the hours. That’s the only way to get better. Also, it’s not going to be easy. Develop a thick skin. There’s going to be a lot of rejection. A lot. See if there’s anything to be learned from it or just ignore it, but just keep doing your work and trying to get better. You have to keep doing it and need to keep doing it. Do it for yourself and no one else. You can try to please people and that will get you only so far. And it will probably just screw you up in the long run. Ultimately, you need to please yourself first and foremost. Whatever you’re making, make it your way and let everyone catch up with you. About the only word that feels appropriate is: persistent. Though I would love to be, I am not some brilliant writer who believed that he was destined for greatness as a child. I’m a guy from Detroit just worked and kept working. (That’s sort of what we do here.) And I also tried to create circumstances that allowed me to do so. Even when everyone was telling me no, and rejecting my work, I just kept doing it, no matter how much it hurt. (They’re still telling me no, by the way. It never ends.) I didn’t quit. I’m still not particularly satisfied with where I’m at, but I’m not expecting it to get easier. I still have to be persistent. For more information about Michael, CLICK HERE. This entry was posted in Armenian, Journalism. Bookmark the permalink.